In early June we left the Wallowa Valley of Eastern Oregon and drove over the Blue Mountains to Kennewick, the major small city in Eastern Washington. We had an appointment there to service our truck, but we have many old friends living there too. We set up at our friends, John and Lorie’s, ranch in Badger Canyon outside of Kennewick. For the next five days we barbecued with them while the coyotes yipped from the creek below. We visited with friends we hadn’t seen in a long time and celebrated Sonia’s birthday with all of them at a local winery. It was a welcoming and comfortable stop. After picking up some RV supplies and servicing the truck, we moved on. Our first stop was Lake Chelan on the eastern slopes of the Cascade Mountain Range. This magnificent fifty-mile long lake forms a majestic fjord cutting fifty-miles into the Cascade Mountains. At the lower end of the lake is the busy tourist town of Chelan in the rolling, open sage lands above the Columbia River. By the time you reach the upper end at tiny Stehekin (accessible only by boat or float plane) you’ve entered the deep, green forests and glacier-covered mountains of the North Cascades. We arrived on Thursday and set up at Twenty-Five Mile State Park, at road’s end about a third of the way up the southern side of the lake. Like most Washington State Parks it was expensive, $30 for a dry camp site, and no cellular service. Not liking to travel on weekends, we decided to stay Friday and Saturday nights too. But, the park was fully reserved with just one spot open; a full hookup site for $40/night. We moved into it. Washington State Parks cost $10 to enter unless you buy an annual Discover Pass for $30, then you enter any state park without any further charge (camping fees are separate from the entry fee). We bought the pass since we were going to visit more Washington State Parks in the next couple months. Twenty-Five Mile Park turned out to be one of the biggest disappointments of our trip. The sites are close together, poorly laid out with no privacy and, as the weekend arrived, crowded and noisy with so many campfires we had to hide inside to breathe. We spent our days away from the place. We took the Lady of the Lake ferry boat up the lake to the tiny village of Stehekin at the base of North Cascades National Park, the craggy glacier-covered summits rising from the wilderness behind town. In town we took the hour-long tour to Rainbow Falls returning in time to board the ferry for its slow, “down-lake” trip. The boat trip cost $40/each, the waterfall tour another $10/each, but it was all worth it. The views from the boat are spectacular, the falls impressive. When Sunday morning arrived we woke early, dumped our waste tanks, filled our water jugs, hitched up the trailer, and left. We followed the Columbia River on highway 97, then turned north along the Methow River (met-how), and into the Methow Valley. This is a beautiful place on the eastern slopes of the Cascade Mountains with the two towns of Twisp and Winthrop set in the center of wide valley surrounded by vast wilderness areas. The clear, cold Methow River flows through it all towards the Columbia River below. In winter, the largest Nordic ski area in North America operates here. We have friends to visit here too, but first we drove 12-miles out of Winthrop, up Forest Road 51 along the Chewuch River (chee-whack), to a dispersed camping area in the forest. Here we found a large grassy meadow by the river in the ponderosa pine forest just below the U.S. Forest Service’s Falls Creek Campground. There were a few other RVs scattered along the riverside, but far away from us. The area is state land managed by the Washington State Department of Fish and Wildlife and free if you have a Washington State Discover Pass which we did, having just purchased it at Lake Chelan. Ironically, our unpleasant stay at Twenty-Five Mile State Park was paying off in unexpected ways. We celebrated with a burger and beer at the Old Schoolhouse Brew Pub in Winthrop. The campsite, though beautiful, has no water, no cellular service, and was infested with mosquitoes (when setting up for long stays we like to have cellular service to access the internet). So, in the morning we moved to another Washington State Fish and Wildlife camping area just six miles outside of Winthrop and ½ mile up Forest Road 37 (Boulder Creek Road). This area was still along the Chewuch River and still free with our Discover Pass, but here we had a strong 4G Verizon cellular signal and at least a few less bugs. Still, we had to set up our “bug-palace”, a large screen-sided tent, to find some relief from the relentless mosquitoes. There’s no water, no power, no picnic tables, no trash cans, and just a conuple of foul-smelling pit toilets (time to dig a hole). But, there were also no people and plenty of private, flat and roomy camp sites scattered amongst the ponderosa pines and meadows, large enough for any size rig to fit into. As a bonus there are miles of back roads, including Boulder Creek Road itself, for some excellent mountain biking. We set up here for the next week. That business done, we drove the truck into Winthrop to visit with old friends, Laura and Casey, who live in an isolated cabin high above the Methow Valley. The next day we drove up to Hart’s Pass, the highest point in Washington State that you can drive to, but the road to the summit was still covered in snow, so we hiked around the alpine meadows to admire the acres of wildflowers and views of the North Cascade Mountains. 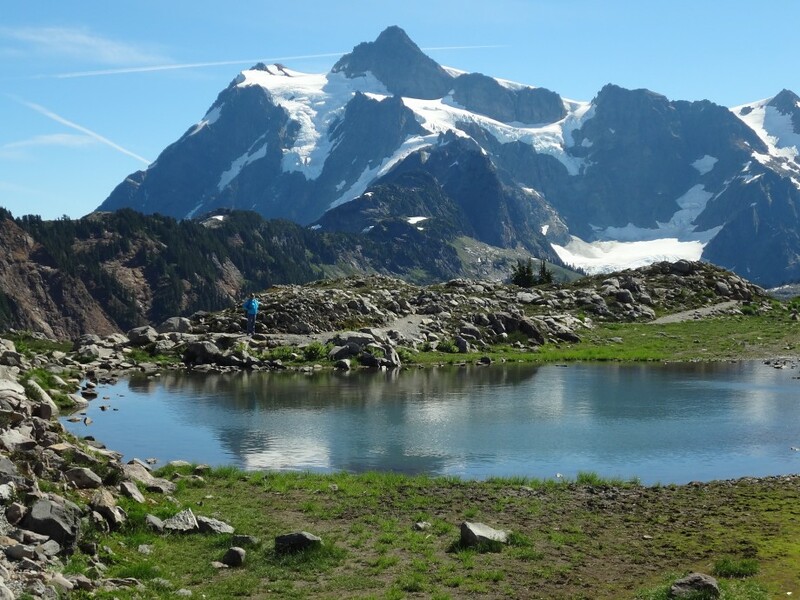 The following day we drove into North Cascades National Park taking short walks into the deep forests and glacier-covered mountains of this magnificent wilderness park. I spent a couple days mountain biking along the backroads outside of Winthrop. I spent a couple days on longer, strenuous hikes; up Tiffany Mountain in the center of the Okanogan Highlands, and through Pipestone Canyon, a unique area in the wilderness outside of Winthrop. I had these places to myself, no one else around, and from these high points I could see across the Sawtooth and North Cascade Mountains far into Canada. I spent another afternoon floating down the Methow River in a drift boat with our friends’ son, Blaze. Fine times in the Methow Valley. After doing all this, we still had another week before we settled into Anacortes Washington. So, we planned to spend it in North Cascades National Park. But then John and Donna in British Columbia, Canada invited us to stay with them. They had been following our blog and Facebook reports and saw that we were in Washington State just a few hours from their home in the small mining town of Logan Lake outside of Kamloops, British Columbia. We happily accepted their invitation. We finished our stay in the Methow Valley with a bike ride through the forest with our friend, Laura, and then attending Winthrop’s first annual Brewfest where our friend and brew master Blaze was presenting a special IPA made for the occasion. It was a fitting end to our stay. In the morning we packed up early and drove off towards the Okanogan Valley enroute to British Columbia; reluctant to leave this very special place but hoping for fewer mosquitoes and looking forward to seeing our Canadian friends. When we arrived at the small mining town of Logan Lake, British Columbia we were happy to see John and Donna, but the mosquitoes were waiting for us in force. Never mind, we had a good time visiting and hiking around with them before we migrated back to the Methow Valley for a few days before moving on to Puget Sound and Anacortes Washington. All in all, June was a great month in the Pacific Northwest. Next; Anacortes, sea kayaking, Seattle, hiking and biking in the North Cascades.